Specific strategy to score high on all TOEFL tasks. and not do, to get top scores in each section,and each question. 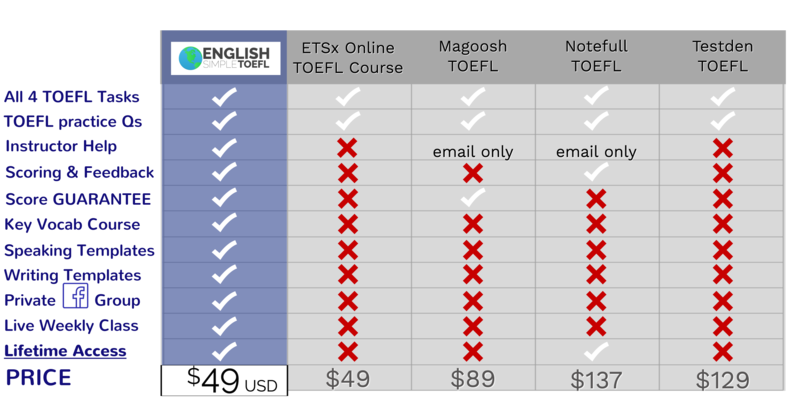 English Simple provides actual model tests based on the real TOEFL so you’ll feel relaxed and ready on the day of your test. instructors to answer all of your questions about the TOEFL test. Plus, you get a full speaking test and 5 full writing tests scored with feedback! practice + recorded myself and got 30 on the speaking part! !